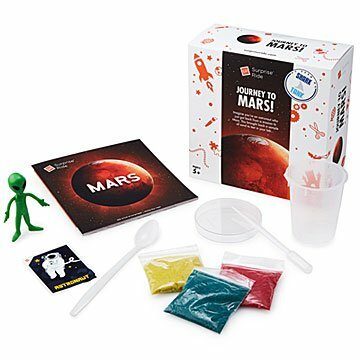 Give your junior astronaut a rocket booster of fun with this kit featuring Mars-like "space sand." Your kids might be among the first people to join the Curiosity rover that's already exploring Mars. Until then, give your junior astronaut a rocket booster of fun with this kit featuring "space sand" like that from the Red Planet. Much easier than making the 45 million-mile trip, the sand experiment lets them see how Mars sand is hydrophobic (it never gets wet). Ok, so that's literally dry science, but they can also learn all about Curiosity's home with the far-out book filled with Martian facts, profiles of famous astronauts (and cosmonauts), and planetary jokes to share with friends. They can even adopt the friendly alien included in the box for extra orbits of imagination. Made by sisters Rosy and Donna Khalife in California. For ages 5+. Creative sisters Rosy and Donna Khalife make hands-on, educational activity kits that give kids a break from screen time. Their own dad offered them fun DIY activities throughout their childhood, so they made it their mission to create such memorable moments for other families. That mission has inspired over 50 products and they've received accolades from parenting experts and shows like Shark Tank and The View. Rosy and Donna's dad must be proud. My nephew loved it, and I loved that the kit was so thought out and included everything and anything you could think of! They also use the same tools (petri dish, pipette) that he uses in the science classroom, plus there is a fun, educational book that comes with it. He's 8 years old, so he was mostly able to do the entire experiment by himself, which his parents mentioned was great! It was a great learning activity for kids and definitely plan to order another one!